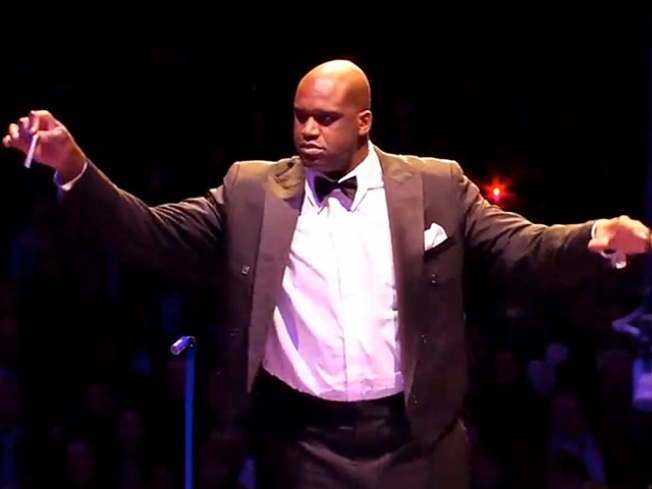 Baller leads the Boston Pops in "Sleigh Ride" and "We Are the Champions"
Shaquille O'Neal traded his ball for a conductor's baton and a teenie bow-tie Monday to lead a holiday concert at Boston's Symphony Hall. The oversized baller, performing in a tux with coat tails under the name of Maestro Shamrock, is no stranger to this kind of stunt—not only does he frequently face off against celebrities on his reality show "Shaq Vs.," but he also has been organizing "random acts of Shaqness" since moving to Boston, including a stint as a "human statue" in Harvard Square. However, Monday's Boston Pops gig was a new high for the athlete, who led the world class orchestra in renditions of "Sleigh Ride," "Can You Feel It," and, most memorably, "We Are The Champions" (in addition to the clip above, footage of the concert is already available pretty much everywhere online, as well as this gallery by NESN). After the rehearsal, Shaq apparently told the press he had a "whole new respect for conductors…my arms are shot right now!" Sadly, this might mean he is too tired to perform with Wu Tang later this week—not that he had ever promised such a thing, but an online petition has been circulating among hip hop fans to little effect, which is a bummer because that's one show we'd love to see.